Anti-GMO sentiment holds back agricultural advancement in the developing world, but an Iowa State University agronomist hopes his research will clarify the scientific consensus and spark wider acceptance of the technology in Africa. An online, interactive course to develop successful long-term weed management programs. Plan ahead. Dealing with herbicide resistance can be expensive. The United States Department of Agriculture estimates the cost of dealing with herbicide resistance once it occurs to be $20 to $60 per acre. 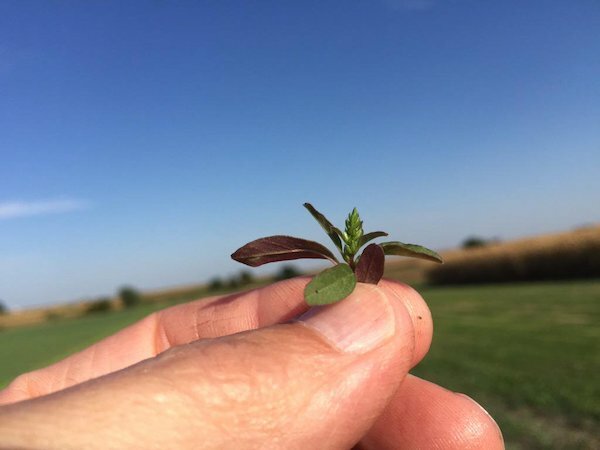 Therefore, implementing a long-term weed management strategy that reduces the chances of resistance developing will maximize long-term profitability. This online, interactive, and self-paced course contains narrated presentations, lesson activities, and resources to provide farmers and agribusiness professionals the tools to develop successful long-term weed management plans that will maximize long-term profitability. Well worth the $50 to register. AMES, Iowa – The American Association for the Advancement of Science (AAAS) is honoring seven Iowa State University researchers for their work in agriculture, biological sciences, chemistry and engineering, including our Dr. Jianming Yu. The seven are among 416 researchers from around the world who make up this year’s class of AAAS Fellows, the association announced today. The new fellows are being recognized “because of their efforts toward advancing science applications that are deemed scientifically or socially distinguished.” Dr. Yu joins the limited company of only 40 other faculty at Iowa State University as a AAAS Fellow. AMES, Iowa — The Agronomy Hall auditorium at Iowa State University has been named in honor of a Webster County couple who farmed near Duncombe for many years. The W. Kiley and Marie Powers Auditorium is located in the southwest corner of Agronomy Hall on the Iowa State campus. The auditorium, which was built as part of an addition to Agronomy Hall in 1986, is used for classes of 120 students, accommodating courses taught across the College of Agriculture and Life Sciences and the university. A reception for the naming of the Powers Auditorium was recently held in Agronomy Hall with ISU President Wendy Wintersteen and relatives and friends of the Powers family. W. Kiley and Marie Powers were Iowa farmers who believed in hard work, agricultural innovation and education. Married in 1943, the couple farmed land that was in the Powers family for more than 100 years. Kiley Powers’ grandfather, Patrick Powers, acquired land making up the farm in 1864 and 1869. Four Agronomy students competed in the North Central Weed Science Society Student Contest at Monsanto’s Water Utilization Learning Center in Gothenburg, NE on July 26. The team of Andrew Blomme, Hailey Daufeldt, Rebecca Johnson, and Heather Wilson finished second among undergraduate teams. The contest consists of events in weed identification, herbicide identification, sprayer calibration, and field problem solving. Andrew Blomme finished in first place in the individual sprayer calibration event. Bob Hartzler, Eric Jones, and John Hinz (Bayer Crop Science) served as coaches. The Department of Agronomy is mourning a treasured member of our faculty. Dr. Raymond Arritt has passed away after experiencing a stroke. Dr. Arritt was an integral part of our agricultural meteorology team for 25 years. He was a valued contributor to research, not only within our department but around the world. Dr. Arritt’s research focused on aspects of weather and climate that relate to the land surface and agriculture including crop cover and soil moisture, changes in rainfall extremes over the central U.S. and the long-distance dispersion of pollen. An agronomy student will be one of three Iowa Staters honored during the Gold Star Hall Ceremony this afternoon in the Memorial Union. Robert Vance Rannells of Dunlap, Iowa, enrolled at Iowa State in 1936, studying agronomy. A month before receiving his degree, he enlisted in the U.S. Air Force Reserve. He died in April 1945 when his B-29 bomber went down in the Pacific Ocean near Japan. Rannells was born Dec. 9, 1918, to William and Adah Rannells. Growing up in Dunlap, Rannells worked the family farm like so many other Iowa farm boys. They raised cattle and harvested corn, soybeans and alfalfa. He trained in radio operations in Sioux Falls, South Dakota, and ranked in the top 10 percent of his class. Before leaving for active duty in the Pacific Theater, Rannells married his college sweetheart, Virginia Lynch, in March 1943. November 5-9th is National Distance Learning Week, sponsored by the United States Distance Learning Assocation (USDLA). The Department of Agronomy recognizes the importance and value distance education provides to students across the globe. Distance education in Agronomy dates back to the 1990s with the widespread availability of the internet. Today, two distance programs are offered in the Department of Agronomy. Celebrating its 20th Anniversary, development of the MS in Agronomy began in 1995 and the program enrolled its first students in 1998. The program offers tremendous value and accessibility to students who work full time while attaining an advanced degree. That value has been leveraged by students in 44 states and six countries around the globe.